In June 2017, Amanda Elliot attended the ICT workshop alongside colleagues from EMH Care and Support. EMH provide support, care, activities and housing for people with learning disabilities and older people. 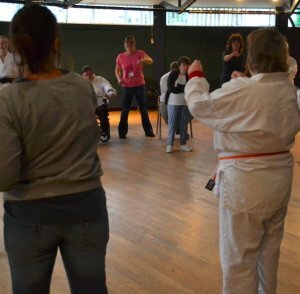 Amanda's role as Deputy Project Manager sees her interact with service users on a regular basis through which she has helped to develop new activities including karate and yoga. Read how the ICT training helped Amanda. Q. What age group do you work with? Q. Before the training did you deliver physical activity to disabled people? A. Yes - I helped to deliver sessions in boccia, bowling, sailing and karate to our users. Q. Why did you decide to attend this training? A. To learn how we can adapt sporting activities to suit the individual to enable all to get involved. Q. What were the key points you gained? A. The STEP (Space, Task, Equipment, People) approach thinking about space, the task and the equipment that was most effective for our service users. 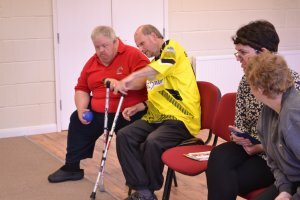 It gives more control over the activity, it simplified for service users to understand and the equipment is adapted to a persons ability. Q. Since the training have you put any of the skills you learnt into practice? A. Yes - we have been able to apply it to activity sessions in stand up and sit down badminton, relay races and adapted rounders. Q. What other impact has the training had? A. I have observed more and made sure the individuals were placed in a position fairly so they were not set up to fail and could take part. This has helped our users as the sessions are more inclusive. It has also helped to improve my confidence and knowledge on what equipment is available. Are you interested in adapted physical activity training?